This cutlery set is a top seller. 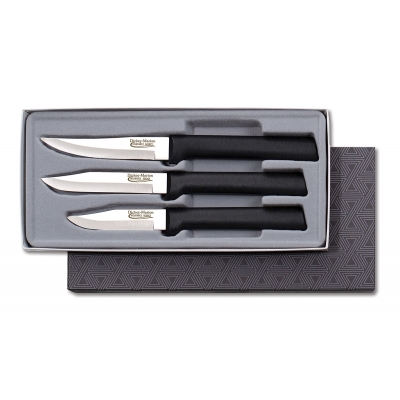 This attractive gift set will satisfy the need for various sizes of paring knives. These useful tools will be appreciated by your customers and employees for many years. Your corporate logo will last decades on this vital set of tools for the kitchen. This set includes: Peeling Paring, Regular Paring, Heavy Duty Paring. The price includes permanent electro etching on the front of the blade of each piece in the set. Care: Although fairly dishwasher safe, the manufacturer recommends washing and drying by hand, to protect the beauty of the fine finish. Packaging: A beautiful 2 piece gift box with a soft gray flocked insert. See the packaging pictures at the top. Option: Imprint the back side of the blade. There is a running charge plus setup charge. See menus above. Production Time: 3 weeks after proof approval.